Slackerwood | Deep in the heart of the Austin film scene. You're reading the archives of Slackerwood, a website about Austin film written/published from 2006-2015. Hope you'll enjoy our columns, reviews, and other features, many of which are still relevant and interesting. The site is no longer maintained, so please pardon any outdated or broken links. Contact Jette Kernion (jette [at] slackerwood [dot] com) with questions. "Of all liars, the smoothest and most convincing is memory. "* I saw Kid Blue at the Paramount during Austin Film Festival 1997, and I remember a lively, responsive audience that loved a very weird and very funny movie from 1973. Afterward, the film's star Dennis Hopper and screenwriter (and Austin author) Bud Shrake had a rollicking good time onstage telling crazy stories about shooting the movie in Mexico. I've been encouraging people to get their hands on the movie ever since, but it's not on DVD or Blu-ray and it hasn't been screened in Austin since AFF. Fortunately, it's available online via Amazon, although the picture/sound quality is not stellar. Over the past 17 years (damn, it cannot have been that long), I overhyped myself on Kid Blue. But it's a fascinating movie, if not as funny as I remembered it. As a 1970s oddity, the counterculture Western falls somewhere between the barely comprehensible Eggshells (Tobe Hooper's first feature, read Don's review) and a movie I like far more than it deserves, Harry and Walter Go to New York. The counterculture Western opens with a botched train robbery by a gang that includes Bick (Hopper), aka the notorious Kid Blue. Sick of the outlaw life, he decides to go straight and get a legitimate job, and he ends up in the small Texas town of Dime Box. And it is in Dime Box (the movie's original title, incidentally) that this long-haired ex-bandit encounters The Man, in all his incarnations. All Bick wants to do is lead a normal, law-abiding life, but Sheriff "Mean John" Simpson (Ben Johnson) is automatically suspicious, and other self-important townsmen dismiss and belittle him as a clumsy, naive hoodlum. (Hopper was in his thirties at the time, but he looks like a baby.) He finds a potential friend in Reese (Warren Oates), but his wife (Lee Purcell) seems a little too friendly. 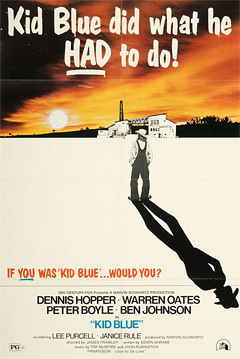 Kid Blue may be set in the early 20th century (it's a bit vague on that point) but the attitudes are pure 1973, with the more pious townspeople spouting cliches about patriotism, the unemployed/poor bringing it on themselves, young men needing to learn respect for their elders, and native Americans being "savages." The local preacher has an interesting drug habit, and the town's Native Americans are continually smoking something mind-altering. "Good-bye. Don't forget to feed the parrot!" shrieked Flora, who disliked this prolongation of the ceremony of saying farewell, as every civilized traveller must. "What parrot?" they all shrieked back from the fast-receding platform, just as they were meant to do. But it was too much trouble to reply. Flora contented herself with muttering, "Oh, any parrot, bless you all," and with a final affectionate wave of her hand to Mrs. Smiling, she drew back into the carriage and, opening a fashion journal, composed herself for the journey. Saying farewell to Slackerwood has been very difficult. And I do think of it as "au revoir" -- I'm still in Austin, I'm still writing, and so are many of the current Slackerwood contributors. You'll see us again. 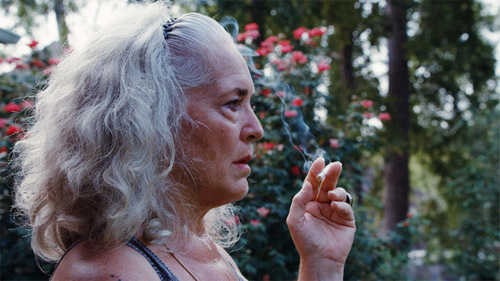 Slackerwood may be winding down, but the Austin film and festival scene is going strong. We've reviewed a number of movies at local and national film fests that have not yet had a full theatrical release. Many of them have Austin and/or Texas ties. I originally said that today -- Wednesday, May 27 -- would be the last day Slackerwood would publish new content. But we're going to finish tomorrow instead. As I've said often, well, it is called Slackerwood after all. So please come back on Thursday for a farewell and one final Lone Star Cinema that I always said I would write and never did (until now). Five years and 51 weeks -- that's when I was added to the Slackerwood website, although my official first article about a beloved made-in-Texas film, True Stories, was actually published on June 24, 2009. Coincidentally, my first Slackerwood-related article, "Coffee and Cigarettes at the Alamo," was written two years earlier on June 25, 2007 for the Alamo Downtown Blog-a-Thon, co-hosted by Slackerwood and Blake Ethridge of formerly of Cinema is Dope and now the Museum of Cinema. 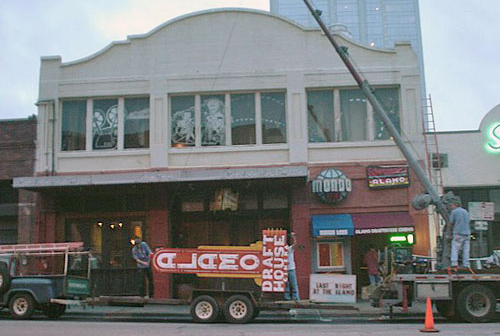 Sharing my personal experience of handling the Coffee and Cigarettes director Jim Jarmusch at the original Alamo Drafthouse (on Colorado) during SXSW Film Festival 2004 was truly a defining moment in my career in film journalism. That same year I recall Louis Black assisting at the door at a special midnight screening of Hellboy at the Paramount, with star Ron Perlman talking to fans outside the theater until the wee hours of the morning. I truly believe that without the efforts and support of local film industry vanguards like Louis Black of Austin Chronicle and SXSW, and Tim and Karrie League of Alamo Drafthouse, I would not have met Slackerwood's founder and editor Jette Kernion. Most if not all of my initial conversations with Jette about film took place on the outdoor patio at Alamo South Lamar either during subsequent SXSW and Fantastic Fest film festivals. 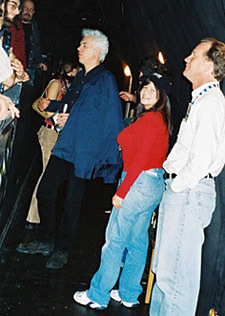 On that special night in 2004 that I blogged about, I was introduced to writer and director Jonathan Demme by Black, and assisted Crispin Glover and Canadian filmmaker Ron Mann (Go Further, Know Your Mushrooms) in and out of the screening at the personal -- and quite polite -- request of Jarmusch. Over the years of writing for Slackerwood I've encountered Mann on his annual visits to Austin for SXSW, and enjoy hearing about his latest film projects. Additionally he graciously gave Courtney Cobb (Crafting a Nation) and me some documentary filmmaking tips while we were in pre-production for Pushing Cadence. Fantastic Fest, SXSW Film Festival and Austin Film Festival provided me with great opportunities to cover great independent film and network with filmmakers, actors and industry representatives from around the world. Six years ago I never would have thought that I would cover a film festival outside of Austin such as Dallas International Film Festival, let alone Sundance Film Festival. And yet I've made it to Park City for the last three years to cover both Sundance and Slamdance Film Festivals simultaneously to the best of my capability. Film on Tap is a column about the many ways that beer (or sometimes booze) and cinema intersect in Austin. Pursuing multiple and consecutive careers in film, water and craft beer can be quite challenging to juggle more often than not, so I'm extremely appreciative for the patience, understanding and support that Slackerwood founder Jette Kernion has given me over the last six years. One of the columns that I've been most proud of is "Film on Tap," launched during Austin Craft Beer Week in October 2011. Born out of Slackerwood's "How to Drink Like an Austinite" guides, I've enjoyed sharing memorable experiences of well-crafted beer and film -- as well as skillfully mixed cocktails and film curation. While waiting out the torrential rains last Saturday evening, I enjoyed a delectable cherry-infused bourbon Old-Fashioned at The Highball and observed the crack bar staff as they served theatergoers, bar patrons and karaoke enthusiasts. 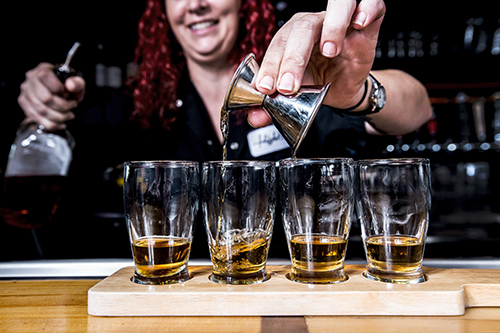 Of all the bars and restaurants in town, there's probably no crew that can match the high frenetic pace and demands of a diverse crowd in the skillful manner that The Highball team handles nightly. Whereas in many crime dramas the difference between the good guy and the bad guy is painted in black and white, writer and director Cedric Jimenez brings the more complex nature of both sides in the emotionally gripping movie The Connection. Based on the true story of French law enforcement's battle with the heroin-dependent drug traffic among France, New York and the rest of the world, this award-worthy film focuses more on the characterization of key players in the battle rather than rely on hyperviolence. Despite his reluctance, French magistrate Pierre Michel (Jean Dujardin) is transferred from the juvenile to the organized crime division in the middle of mob wars in Marseilles, France. As a former gambling addict, Michel channels his obsessive nature into getting to the bottom of the complex network of drug lords, discovering that corruption exists at the top and around him. The cornerstone to all the corruption is Gaëtan "Tany" Zampa (Gilles Lellouche), a racketeer who offers "protection" through the violent persuasive nature of his gang: Bimbo, Franky Manzoni (Moussa Maaskri), and Le Fou (Benoit Magimel). Zampa's expansion from prostitution and gambling into manufacturing and selling heroin places him at the top of the Marseilles crime scene, making him a target as well for the police and competitors. Its been a while since we've had a worthwhile disaster movie at the cineplex. Back in the 1970s, the genre was a staple of the summer movie season with audiences devouring multi-strand plots, which saw stars both old and new struggling for survival against any and every catastrophe an ambitious movie producer could think of. Despite giving audiences some bona fide classics such as The Poseidon Adventure (1972) and The Towering Inferno (1974), the genre has been rather dead as of late with lackluster offerings such as Poseidon (a weak 2006 imitation of the far better original) and the overly confident 2012 (2009). Yet this week, the genre hopes for a resurgence with the impressive looking San Andreas (2015). Starring Dwayne Johnson, San Andreas details a rescue pilot’s frantic search for his family following the most powerful and devastating earthquake ever to hit the West Coast. 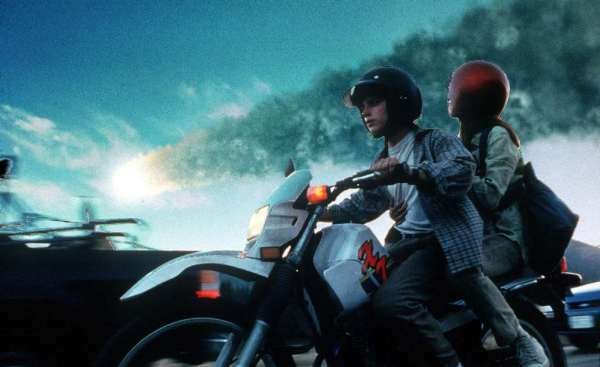 One of the few noteworthy offerings following the post-70s boom of disaster movies was the thoughtful and still entertaining Deep Impact (1998). A high-school astronomy student (Elijah Wood) discovers a random comet that's headed directly for Earth, promising destruction of cataclysmic proportions. While the President (Morgan Freeman) tries to maintain order in the land, a team of experts led by a famed astronaut (Robert Duvall) attempts to stop the comet and an ambitious journalist (Tea Leoni) resolves to come to terms with her past. 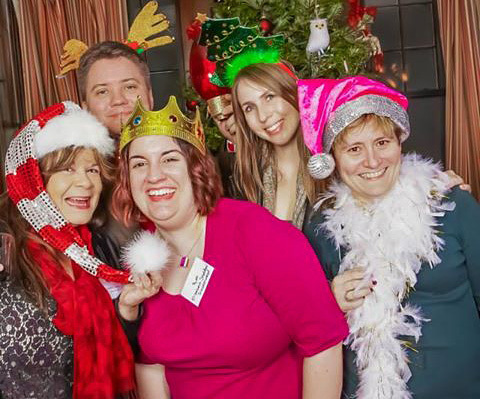 "Ready, Set, Fund" is a column about crowdfunding and related fundraising endeavors for Austin and Texas independent film projects. It's hard to believe that it has been over 3.5 years since the first "Ready, Set, Fund" column appeared here on Slackerwood. This recurring column has served as an incredible vehicle to immerse our writers in local film productions. From set visits to personal interviews with cast and crew, we are all grateful for getting a behind-the-scenes perspective and following film projects from "cradle to grave" over these last few years. Even when a campaign falls short of its funding goals, many filmmakers find other creative avenues to accomplish their film production goals. One such creative talent is Austinite and local performer Troy Dillinger, who has been championing the preservation of historical homes in the hills of west Austin and around Barton Springs and Town Lake. 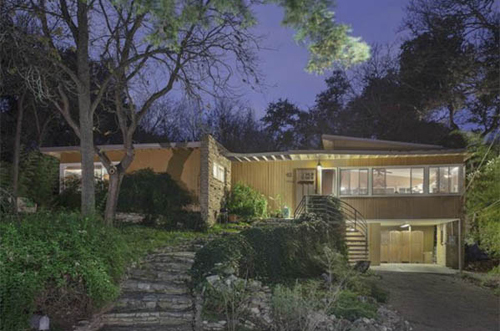 Dillinger has been quite active at Austin City Council meetings as well as on social media to alert Austinites of the pending destruction of several mid-century modern custom homes built by Arthur Dallas "A.D." Stenger throughout his 55-year career. Each home was custom designed for the lot they were built on, often built with repurposed stone from each lot.